KEEP ME INFORMED WITH OBHC NEWSLETTER! ​"WHY WOULD THEY BE SO KIND?" It was a question a disabled veteran asked about the people and businesses in Custer and surrounding communities in South Dakota, who help make these respites possible. 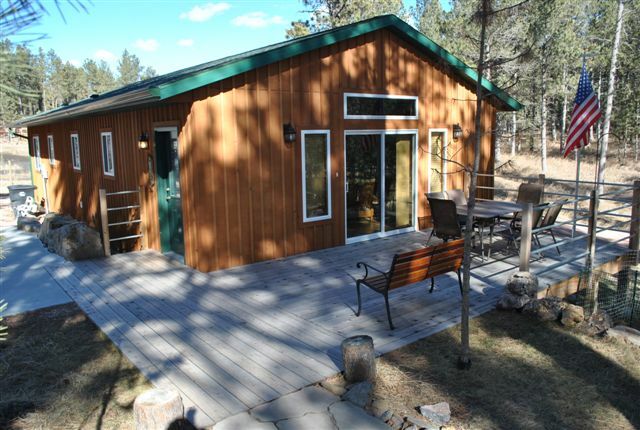 Founded in 2011 by a retired military couple, OPERATION BLACK HILLS CABIN is located in the beautiful Black Hills of South Dakota. It's purpose is to offer a week-long respite, to qualifying wounded veterans from the Iraq/Afghanistan campaigns, and their families, at little or no expense to them. 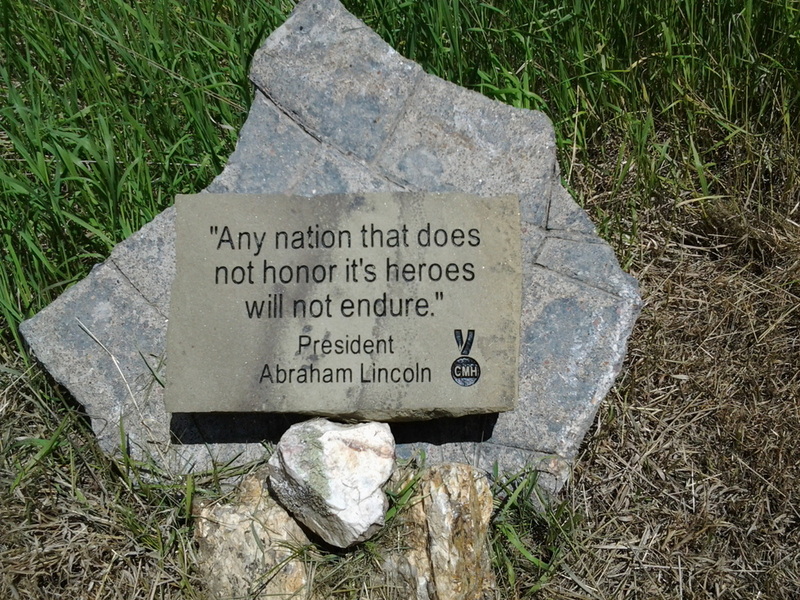 It provides a therapeutic environment to assist qualifying combat-injured veterans with their rehabilitation from their traumatic and stressful experiences, while serving the interest of our Nation. It also provides an opportunity for the disabled veterans to reacquaint themselves with their family in a quiet, peaceful and leisurely environment, far away from the stress and daily routine which has now become their "new normal". See "Frequently Asked Questions" tab (FAQ) for more information. Inspired by the Oprah Winfrey Show "The Bravest Families in America"
Watch OUR STORY made possible by the SD Community Foundation. Go to the ABOUT US, IN THE NEWS tab to learn more about OBHC through other informative stories and newscasts! NOW ACCEPTING APPLICATIONS FOR 2019. Get your application and supporting documentation to us as soon as possible for first choice of dates. Weeks from mid-May through September, 2019 are available. have experienced OPERATION BLACK HILLS CABIN. "It's a Healing Place!" "YES, my husband's military career ended with his final injuries. YES, we lost his way of making a living. YES, I had to quit my job to be his full-time caregiver. YES, he's a different father now. BUT, that does not define us. We are so much more. We are driving a UTV through mud getting filthy. We are playing a board game while laughing so hard we are crying. We are walking down the streets of Custer or Hill City while eating ice cream cones. We are ordering something different at the many great restaurants and trying each other's food. THANK YOU for this week. You gave us back to us." THANK YOU, CUSTER, SD -- the community that keeps on giving! CUSTER HONORED AS 2015 PHILANTHROPIC COMMUNITY OF THE YEAR! 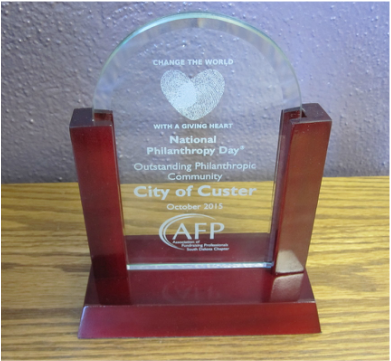 The City of Custer, South Dakota, was honored on National Philanthropic Day by the Association of Fundraising Professionals as the "Outstanding Philanthropic Community" for 2015. This recognition is due to Custer's unending support to all veterans and specifically to its support of Operation Black Hills Cabin. More than 200 volunteers and 40 area businesses have helped to honor and welcome our combat-injured veterans and their families who have visited from 25 states. OBHC could not operate without this support! Thank you to all who generously give their time, talent and treasure. T​HANK YOU to all Thrivent members for their generous donations of their CHOICE DOLLARS! 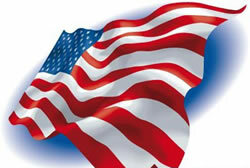 You have helped us make a positive impact on our very deserving wounded veterans and families! Don't let your Choice Dollars expire on March 31st! Please keep us in mind. For more information call 800-847-4836 and say "Thrivent Choice" or visit www.thrivent.com.